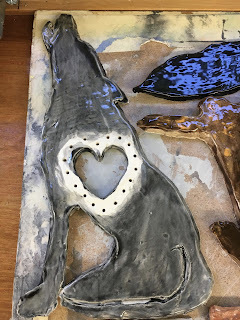 This January I was asked to do a several week clay residency at Muddy Creek Charter School. 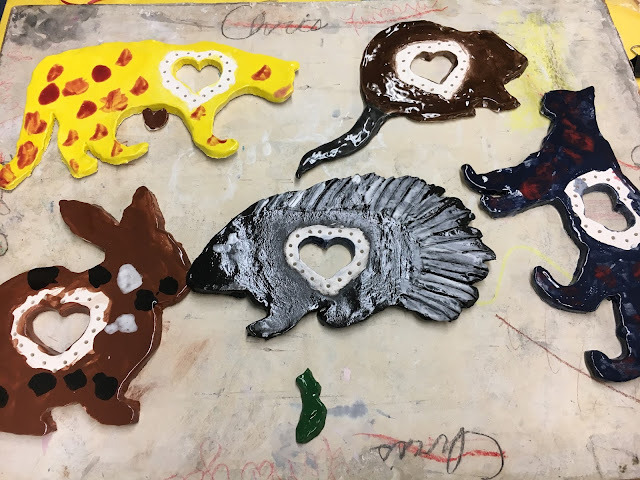 I worked with the Art Teacher Elizabeth Watkins and each of the classroom teachers to develop clay projects that went along with their curriculum. Each class had a total of 3 clay sessions, 2 for making in clay and one for glazing. I will include photos and a brief description for each project below. 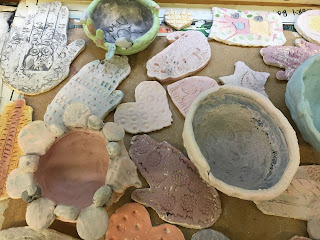 Students made some great projects and had fun learning techniques in clay. I worked as a resource for Elizabeth on construction techniques, kiln firing and general clay guidelines. The goal is that she will be confident leading future clay projects with Muddy Creek students and that the medium can be a more regular part of the curriculum at the school. Kindergarteners used templates to cut out the shapes of different mammals they have been studying. They cut out a heart shape and teachers assisted poking holes around the hearts for string to be woven through at a later time. Students were able to choose to glaze the mammals realistically or artfully and the results are pretty fantastic! Kinders also created small bowls with pressed leaves inside that turned out wonderfully colorful. 1st and 2nd graders worked on creating flat clay owls experimenting with texture for the feathers/ details. 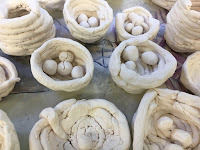 They also worked on making coil nests with eggs inside. 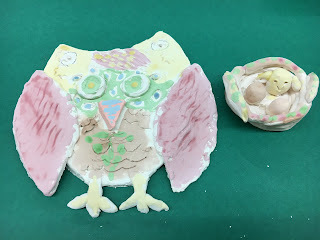 They learned basic clay construction techniques, and experimented with texture and color. String hangers with beads were added to the clay owls after firing so that they can be hung up on the wall. 2nd and 3rd Graders experimented with creating textures in clay. Dried leaves, noodles, beads, shells, etc. were pressed or rolled into the clay resulting in various textures. Students created textured hand prints as well as little bowls that they made into flowers by adding pedals around the rim. 3rd and 4th Graders worked making small hanging bird/fairy houses. Students used a template to create the cone shaped roof and pinch pots for the base and learned construction techniques to attach the two. Lots of time and detail was put into the glazing of the houses. 4th and 5th graders worked on constructing hollow garden gnome figures. The construction process included making all the different shapes of the body and attaching them together well. Students were careful to make figures hollow so they wouldn't explode in the firing and poking a hole in the clay to let the air escape as they clay dried. Students took on the challenge and learned a lot about the properties of clay and glazes. Their hard work resulted in some pretty cool and funky gnomes. New Studio up and Running! !